This is a little late because I’ve been busy: traveling, enjoying the holidays, and doing things worth writing about. Making time to actually sit and reflect and write, well, that’s the hard part. But here I am, cup of coffee close by, settled into my nook in the sofa, finally ready to tell you about our weekend in Porto, Portugal. We invited our good friends Amy and Kenny to come along with us. They hadn’t traveled outside of Germany yet, so we were excited to take them across the border for the first time. We woke up early and drove to the airport, did the usual fun Ryanair experience (if you’ve never done it, please read this post) and when we landed in Porto we were ready for the fun to begin. The first thing we noticed about Porto is that they really don’t want you to get lost. The minute we stepped off the plane there were people asking us if we knew where we were going. Of course we didn’t, so we asked for a map. They told us once we went through the security doors there would be people with maps. And they weren’t kidding – there was a team of about three people, handing out city maps to visitors. And then there was another information center with people at the ready to help you find your train, rent a car, etc. We knew we were taking the metro into the city center, so we went down to buy a ticket. And whaddya know? There was someone down there to help us with the ticket machine. Amazing! The metro was brand new, clean, and I couldn’t help but thinking that Porto has spent some major dollars on tourism. Afterward we needed a good walk, so we walked ourselves to the Museo Nacional de Soares dos Reis, which is the oldest museum in Portugal. I should state for the record that it’s really hard to impress me with museums – unless there is something spectacular in it, I just don’t see the point. The problem is, all museums think they have something spectacular. This particular museum is in a beautiful building and has a variety of Portuguese things in it, statues, jewelry, etc. But the best thing I saw was the furniture. Really pretty furniture. For only 5 Euro, I suppose it’s worth seeing. You don’t really need more than an hour to see everything. That evening we also walked to the Livraria Lello, one of the most recognizable buildings in Porto. It’s an old book shop that was opened in 1906 and it has a gorgeous ornamental staircase and a respectable collection of books, old and new. It is also said to be the inspiration for Harry Potter’s library in Hogwarts. We walked around for a good while, taking it all in, because you’re not allowed to take photos. 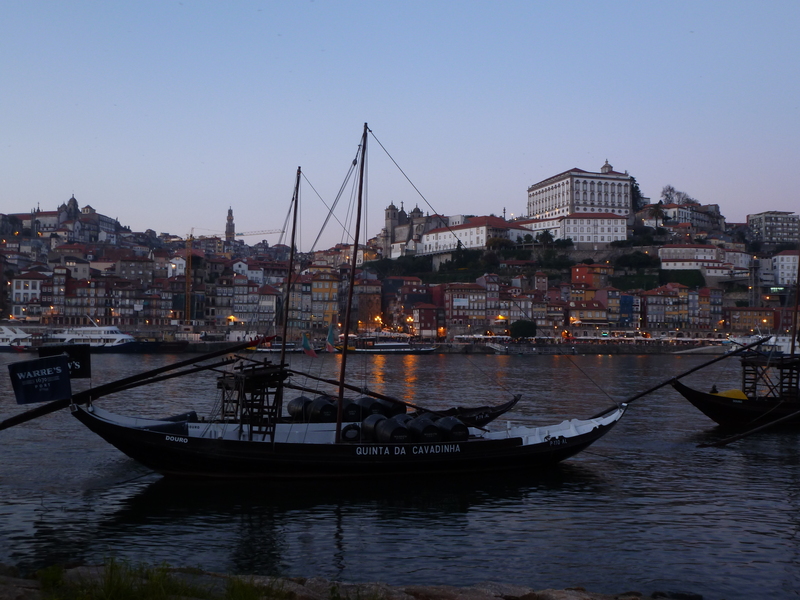 All in all, it is a must-see destination if you ever go to Porto. After that we walked around the city, avoiding the oncoming pigeons, and seeing all the sights. We were all exhausted that night, but sleep didn’t come easy because it’s customary for college kids to dress up in black capes and stay up all night on street corners, drinking and shouting until the wee hours or the morning. Later we learned about this strange tradition, which is not very amusing when you’re tired and trying to sleep. On our second day we woke up to the sun shining and after breakfast headed out to see the other side of the river, the Vila Nova de Gaia (Gaia). 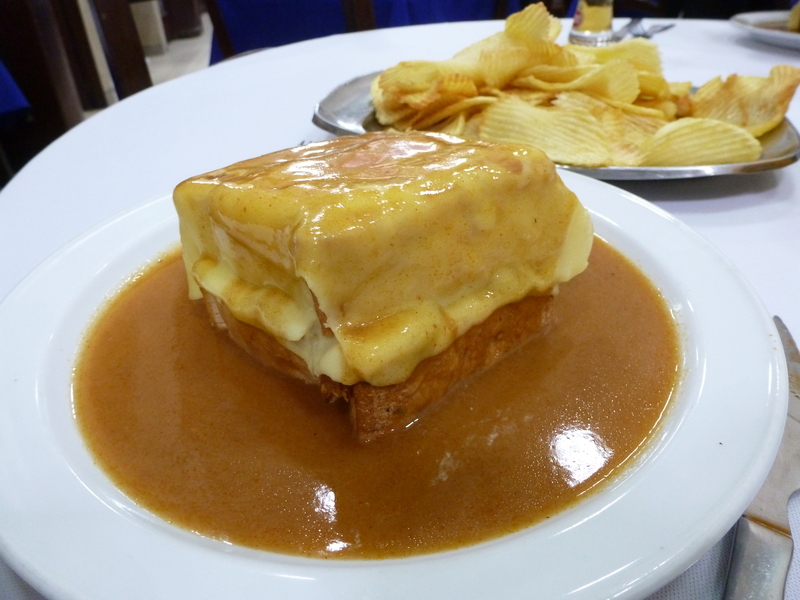 The thing you might notice when you go to Porto is that it is a city that time forgot. It looks old, but in a beautiful way. You can imagine life there a hundred years ago, and aside from obvious modern conveniences, it might not look that different than life there today. We walked across the Ponte Dona Maria bridge and had stunning views of both the Ribeira district (where most of the bars and restaurants are located) and Gaia. While you can take the metro across, I suggest walking because it’s really a gorgeous walk and not really very far. Once we were across, we had to get down into Gaia, which is located quite a distance below the bridge. And that is why they have a cable car, which for 4 Euro, offers a round-trip ride. 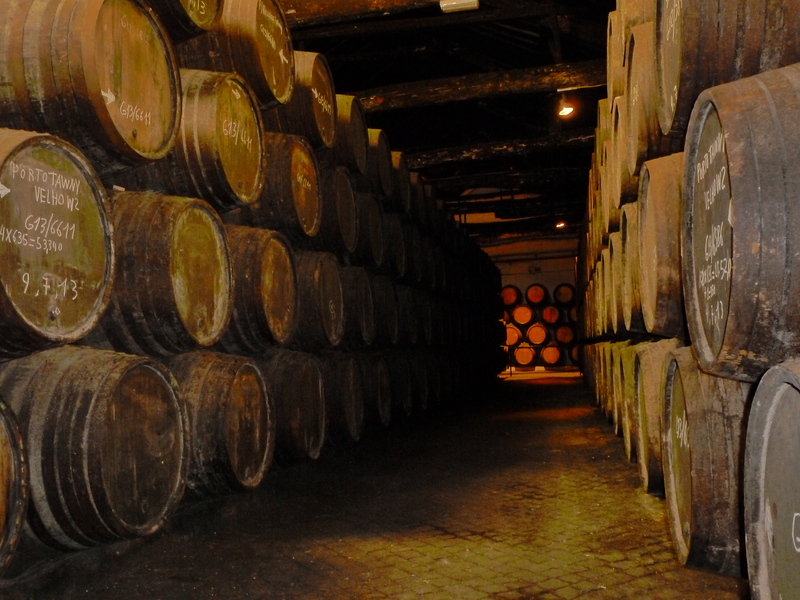 It also offers a free Port tasting at one of the wine caves, so guess where we headed next? Port became a “thing” when the English decided to import it to England back in the late 1600s, and thus most of the Port in Porto bears English names: Croft, Taylor’s, Graham’s, Sandeman, etc. There are a few main types of Port, tawny, ruby, late bottle vintage (LBV), and vintage. You can read all about them on Wikipedia. As I began to say, our free tasting was at Quevedo, so we went there to see what they had to offer. Before we could taste, they kind of forced us to walk around their tasting room and read about the Port process, so we kind of moseyed along and pretended. Eventually we each got three tastes, so I had a tawny, a ruby and a late bottle vintage. Port isn’t really my favorite thing, so I had a hard time with the tawny, which I found to be really strong and slightly offensive. The ruby was a little better, but the only one I found to be drinkable was the late bottle vintage. Of course, it was the most expensive. At this point my husband was seriously jealous of us, because he was on antibiotics and couldn’t drink any Port until the following day, and Port just happens to be one of his favorite things. And there we were, turning up our noses at the stuff. Afterward we walked to one of the few wineries that makes non-fortified wine that I had read about in Food & Wine Magazine, Nieeport. I also checked the Tripadvisor review and everyone said it was amazing. So up the long, windy, incredibly steep hill we went, for what seemed like miles. When we arrived, we walked through the impressive doors and found a cute little courtyard and stone walls, and were excited to taste. But a rude lady came out and told us to leave because apparently they don’t do tastings. This was infuriating, because I was looking directly into a tasting room, with wine glasses, wine bottles, a table, etc. But they didn’t want us there, so we left, unhappily and I felt so bad for dragging everyone up the hill. Down we went…if you go to Porto, don’t bother with Nieeport. Maybe the wine is good, but the service, not so much. We had a light lunch along the river at a cozy café. Since the weather was chilly but still nice we sat outside next to the heaters, and there were blankets on the chairs for extra warmth. Our friend Kenny is Puerto Rican and was excited to see Bacalao on the menu, which is a fish fritter made with salted and dried cod. It looked crispy and delicious, but alas, my peculiar finned-fish allergy kept me away. Eventually we made our way back up the cable car, across the bridge and went back to the apartment for a little rest before heading out for dinner. After reviewing a lot of restaurants online, my husband picked Papavinhos, so we walked our way there. It was not a short walk, but by the grace of God it was all either downhill or flat. Papavinhos isn’t close to anything else, but I promise you it was worth the walk. I posted a rave review on Tripadvisor. Bottom line – go there and eat the bread, olives and cheese, and order seafood. The owners are so friendly and accommodating, and it’s completely affordable, even if you indulge. On our last full day in Porto my husband and I woke up early to visit some of the wine caves and would meet up with Amy and Kenny later. My husband was really excited to finally be able to taste the Port, and we made our way across the bridge, but this time we walked down into Gaia instead of taking the cable car. There was a little café open for coffee, so I made him stop. My days can’t possibly begin without it. After coffee we encountered more of the black-caped, crazy university students, drinking and playing music, hooting and hollering, and asked one of the locals what in the heck they were doing. Apparently it’s normal behavior and much more entertaining during daylight hours. Amused, we walked into one of the wine caves to inquire about a tasting. 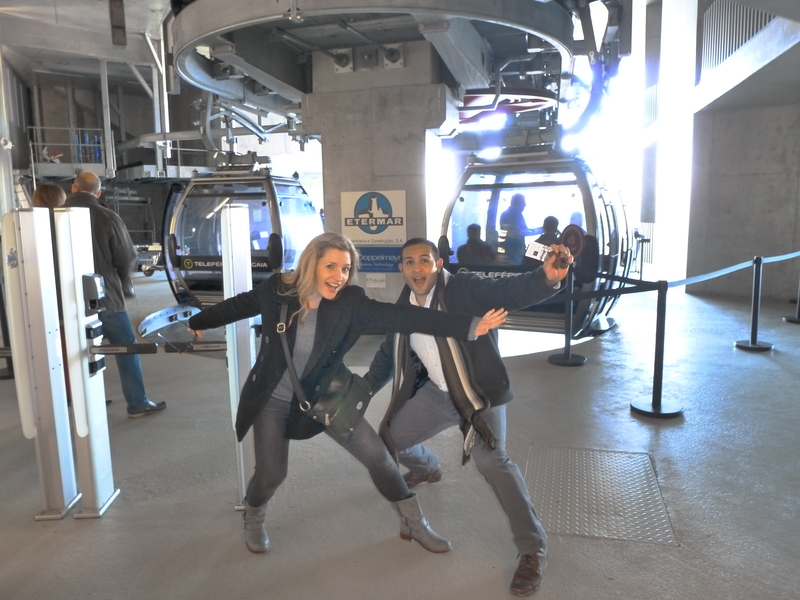 We were told we could make a reservation and come back at 2:00 p.m. That was basically what we were told at every place – not exactly what the guidebooks tell you! So if you go to Gaia to taste Port, make reservations, no matter what you read. While we waited to meet up with our friends we hiked to the Croft wine caves, my husband’s favorite Port, to taste theirs. It was so much better than Quevedo, by a long way. It was smoother, easier to drink, the aroma was softer, and it finished much easier. All of them, the tawny, ruby, LBV, and vintage were so easy to drink that I became a convert. We even tasted their newer and contemporary pink port, and were not disappointed. Our wallets became a little lighter because we bought a few bottles to take home. Amy and Kenny arrived and agreed – Croft Port is something special. 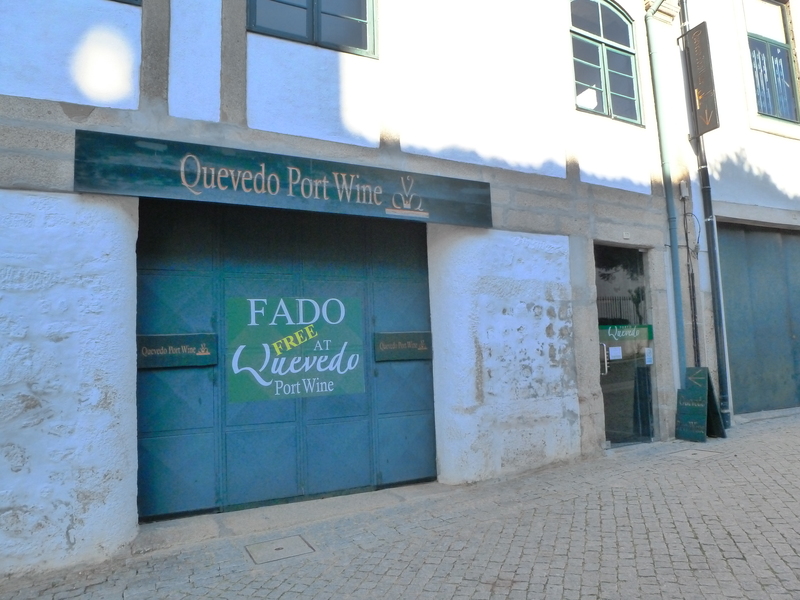 Then we all went and did the wine tour at Sandeman, tasted theirs (much better than Quevedo but not as good as Croft), and then followed up with one more tasting at Ferreira, which had really good Port as well. Since Kenny and Amy had taken the cable car down we had some more free tastings at Quevedo, and my husband wanted to try it so we went back. His findings were like ours, and he didn’t mind the LBV. 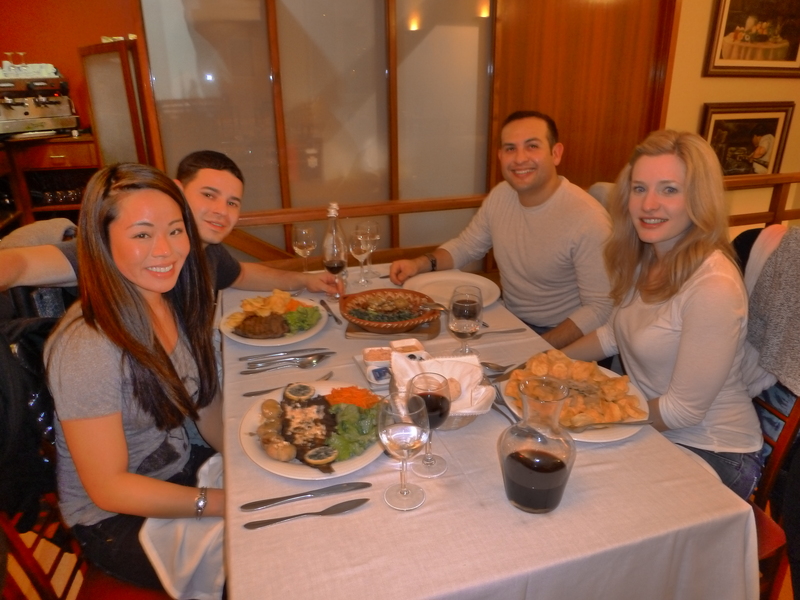 By this point we had consumed a lot of Port but not much food, and we desperately needed to eat. Thankfully we had devised a plan earlier and headed back across the river to Pedro dos Frangos, a local rotisserie chicken joint that got great reviews. We ordered chicken, rice, fries, a giant fish (for Kenny), and some vegetables. Portuguese chicken is my second favorite chicken in the world, after Peruvian, and I had high hopes for it. Unfortunately we found the chicken a little bit dry, and the hot sauce was definitely not Piri-Piri sauce. But we ate it because we were starving, and for the price (around 8 Euro for the chicken, rice, fries) felt comfortable with our meal. After dinner we went home and fell asleep, until the next morning when we had to leave the apartment at 4:00 a.m. to make our flight home. Porto has so much to offer, a lot of old traditions, beautiful architecture, wine, and lovely food. It doesn’t require a lengthy stay to see most of it, so I encourage you to consider visiting if you’ve got a couple of days in Europe. I should also mention it is extremely affordable, so you an do a lot and it won’t break the bank. Wow – it sounds like you cramped a lot into such a short trip. 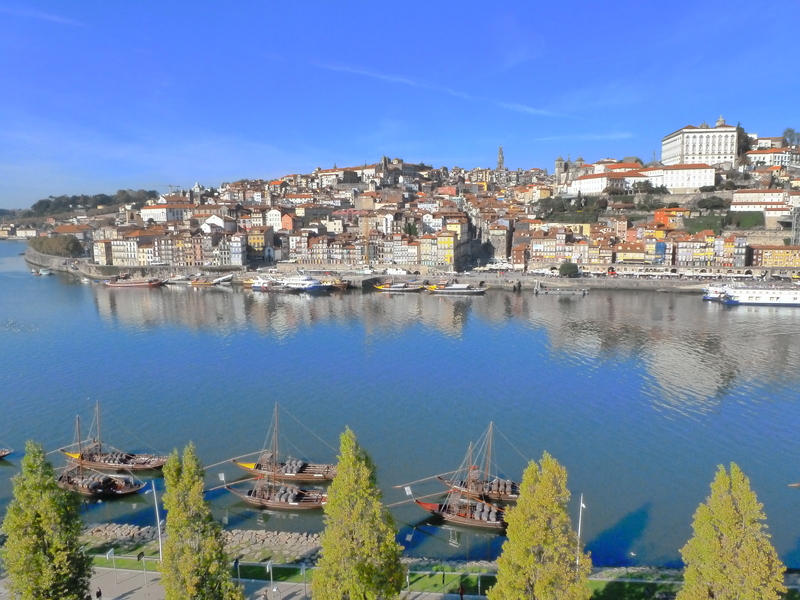 I personally really love port but had never thought of visiting Porto. I’m going to look out for Croft’s next time I’m shopping for a bottle and give it a go. It was a busy and short trip, but we made the most of every moment 🙂 Definitely do try Croft – it’s outstanding and we love it!